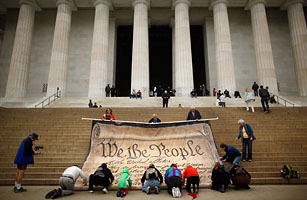 In January 2010, the Supreme Court upheld the right of corporations to spend money influencing political campaigns, ruling that these entities ought to have the same First Amendment rights as individuals to engage in "political speech." The historic  and, in some quarters, infamous  Citizens United v. Federal Election Commission decision fell to a tight 5-to-4 vote. Its implications are huge: superseding earlier understandings, the court deemed corporate money, funneled by lobbyists and special-interest groups into politics, equivalent to any individual donation  even though, by many people's reckonings, a corporation with its resources and focused agenda is hardly the same thing as an individual person. President Obama, for one, was scathing about the verdict, saying "this ruling strikes at our democracy itself." But such prominent First Amendment advocates as Floyd Abrams  often associated with defending journalists' rights  argued vociferously that the court did the right thing by preserving the guarantees of the amendment. Dissenting justice John Paul Stevens wrote that the majority misunderstood the state interests that were at stake and oversimplified its treatment of political corruption. He wrote that the ruling would "undermine the integrity of elected institutions across the Nation."